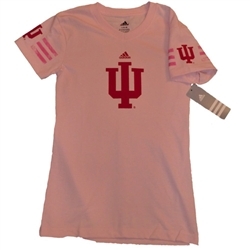 This cute pink v-neck tee has a prominent IU logo across the front with the ADIDAS logo and three stripe styling and IU logos on both sleeves. This shirt is especially designed for your favorite Hoosier girl. Youth girl sizing.